In contracts approved June 30, the City Council was able to cut scheduled pay raises in half over the next two years with the SEIU and the EAGLES, unions representing a total of 359 city employees who originally were getting a 3.2 percent annual raise. About eight police managers also agreed to reduce scheduled raises by 50 percent over two years. No deal was reached with the major police and fire unions to renegotiate existing contracts with pay raises of over 3 percent a year. "We worked real hard" over many "Tuesday afternoons at 5 p.m." to come to an agreement, said council member John Inks. "We did try with the POA and the firefighters," he added, "but we just couldn't get it done." While the city's revenues are expected to remain flat, before the deals were made it was projected that personnel costs would increase by $3.8 million a year. Under the new contracts, the general fund will see a savings of $1.2 million over two years. The city's eight department heads and the city manager, city clerk and city attorney have agreed to forgo raises of 3.2 percent for 2008-09 as well as merit bonuses in 2009-10. Would someone please tell Bay Area Council CEO Jim Wunderman property tax revenues have been rising without a constitutional convention to revise Proposition 13 (“Prop. 13 not off-limits to reformers,” July 3-9 issue). According to the Board of Equalization, total property taxes collected in 2006-07 were $43.16 billion. The oldest property tax stats at www.caltax.org are for 1980-81. That year, property tax revenue was $6.36 billion. Property tax revenue increased by 579 percent since Prop 13 was implemented. During that time, the population went from 24 million to 38 million — an increase of 58 percent. According to the Legislative Analyst’s Office’s budget database, in 1980-1981, total general and special fund revenue for California was $22.1 billion. For 2006-07, it was $120.7 billion. That is an increase of 555 percent. Property tax revenue went up faster than other sources of revenue. 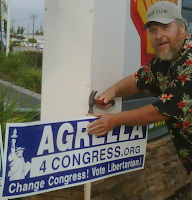 Donn Coenen is trying to take a loose collection of Libertarians and build a strong political alternative with his recent appointment as temporary chairman of the Nevada County chapter. “The biggest growing political group out there is ‘Decline to state,' so that gives us a big opportunity,” to attract new members.